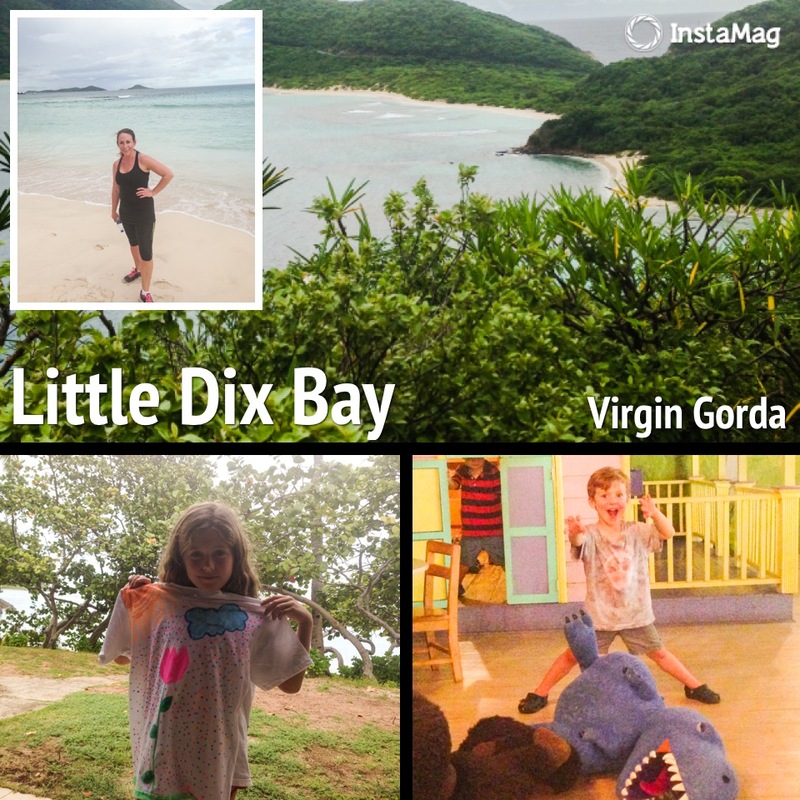 Let me start this review of Little Dix Bay off by telling you that we began our vacation at the Ritz Carlton in St. Thomas for a couple of reasons. 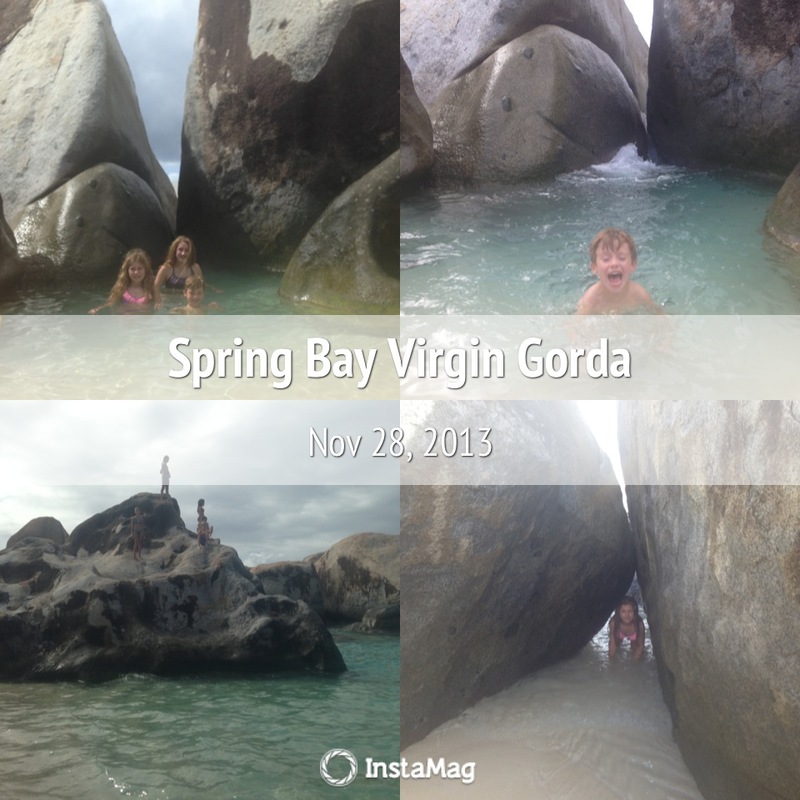 First, the flights were shorter and much cheaper into St. Thomas over Virgin Gorda. 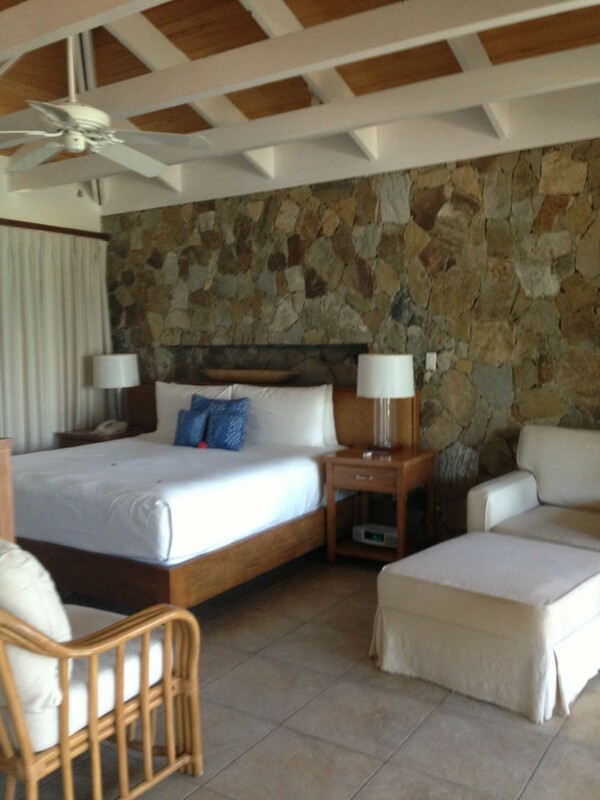 Second, we had previously stayed at the Ritz Carlton in St. Thomas and had enjoyed our stay. 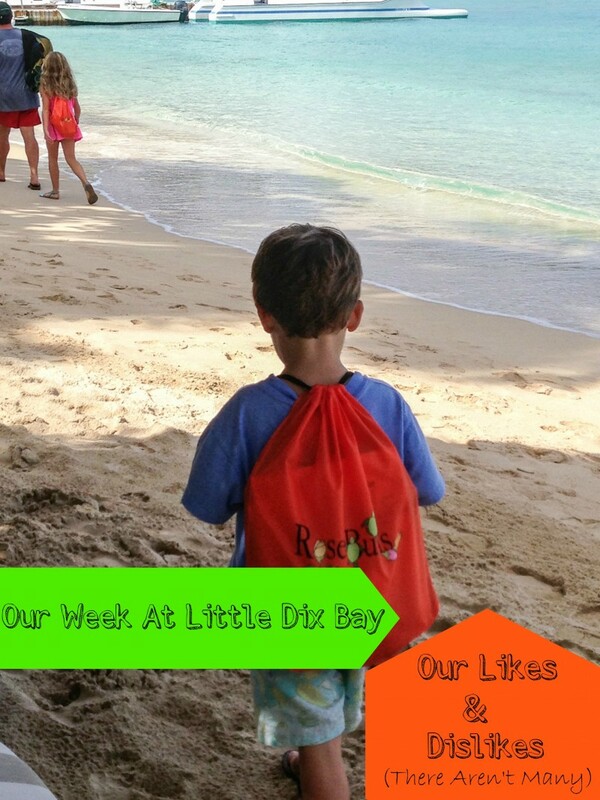 Our brief stay at the Ritz Carlton in St. Thomas was a disaster (more on that in another post), which gave us even more appreciation for the remaining week at Little Dix Bay. FYI: Check with Jetsetter for deals on discounted rooms at Little Dix Bay. They always have a Little Dix package available, and the rates are typically the lowest ones you can find. 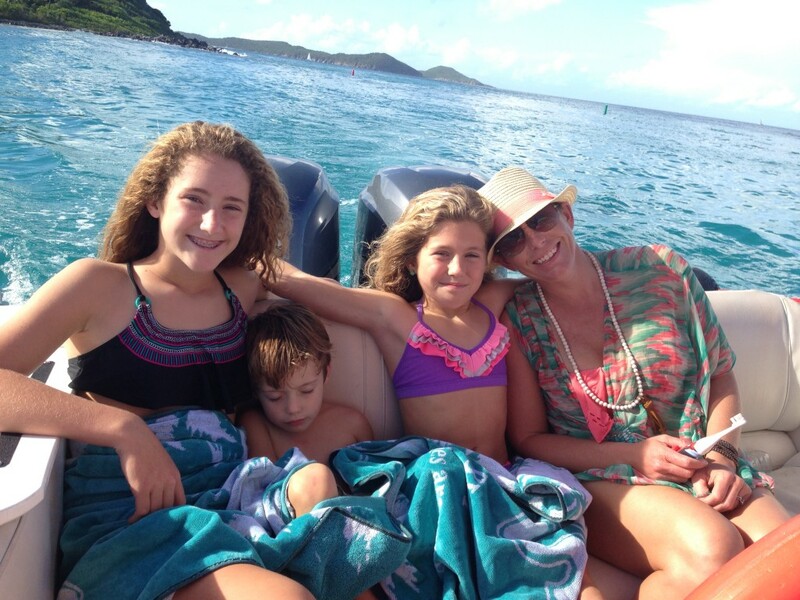 We took a private boat charter to Virgin Gorda from St. Thomas, which turned out to be one of the best decisions we made on this trip. Our boat captain ingeniously chose to check us into customs on Jost Van Dyke. There is a customs office next to Foxy’s bar and restaurant, who knew?! So we hung out at Foxy’s, had lunch and a few painkillers, while our boat captain checked us into customs. It just does not get better than that. Just Saying. Yes, we hung out with Foxy and took our requisite family photo with him. Little does Foxy know that he will be included in the Prickett Christmas card this year. Just kidding! 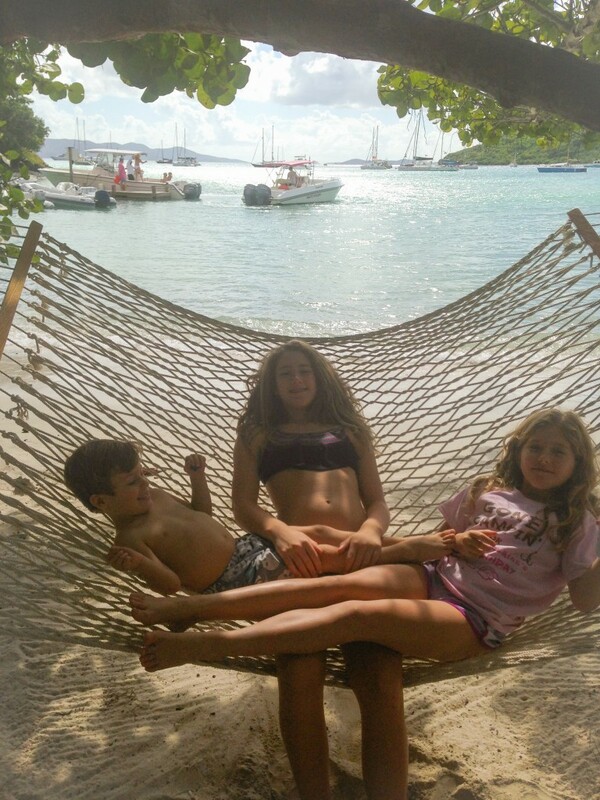 I think this one might be the winner, and it was also taken at Foxy’s on Jost Van Dyke. Our Ritz Carlton disappointment was becoming a memory of the past, and we were ready to hit Little Dix Bay. Upon arrival at Little Dix Bay, we were greeted at the dock by friendly staff member who handled our luggage and took us to our 1 bedroom beachfront cottage. My “like” or rather “love” of Little Dix Bay starts at the beachfront cottage. Location, Location, Location. I think we had to walk maybe 10 steps from our porch to the beach where our private beach chairs were awaiting us. Let’s just say this was a step up from our 3 flights of stairs & million mile walk to the beach from the Ritz Carlton at St. Thomas. The Little Dix Bay beachfront cottage provided ample sleeping space for all 5 of us, as they put two twin size beds and a crib in the living room. Although the decor is simple and not over the top luxurious looking, there was something about it that we fell in love with. 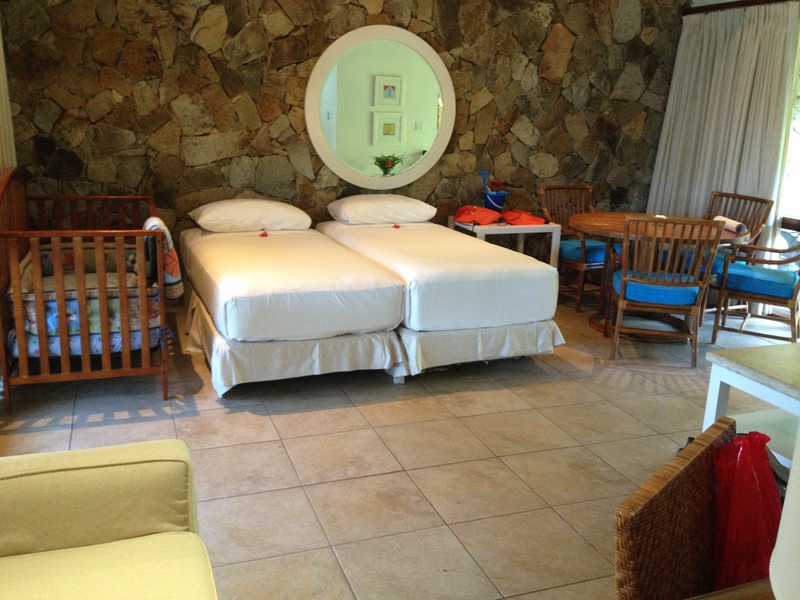 It felt like our own private little bungalow on the beach in the Caribbean, and more like a home than a hotel room. Also, it did not hurt that there was an outdoor rock shower. Another thing we “liked” about Little Dix Bay, was the complimentary Rosebuds Kids Club. First of all, they allow children ages 3 and up. Whereas the Ritz Carlton does not allow children until they are 5. Sorry Ritz, Little Dix is #winning! 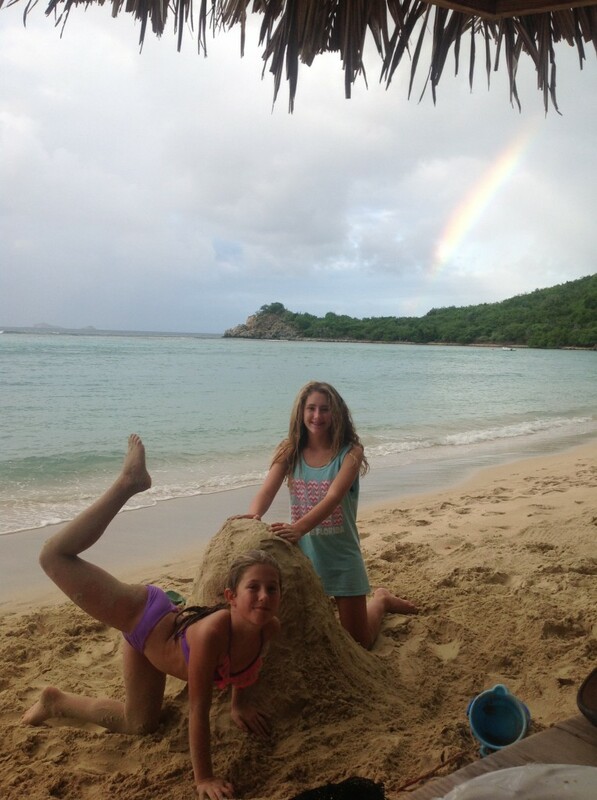 The Rosebuds kids club enabled us to go scuba diving with our 12 year old & hike the Savannah trail sans kids for example. We greatly appreciated that this service was complimentary. Ok, I told you that there would be a few dislikes and there were. While my 3 year old enjoyed the kids club, my 9 year old thought it was terribly boring. We had to bribe here with pearl earrings to go with Murray to the kids club on the day we took Evelyn scuba diving. I’m serious, and I agree this was pathetic parenting. I think the kids club could do a better job of creating activities for older children, and engage with them a bit more. My 12 year old stayed one time with the younger two, and said that the staff was very nice but stayed on their phone most of the time. I will say that they all enjoyed making the t-shirts, so I hope they keep that activity! 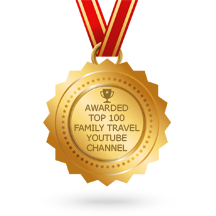 With all that being said, the advantage of offering the complimentary kids club far overrides the fact that my older children did not enjoy it most of the time. Now, back to the good stuff! Little Dix Bay does an excellent job of offering daily excursions at affordable prices. We especially loved the lunch at Spring Bay on Thanksgiving Day. Spring Bay is not technically the “Baths,” but it is very similar except there are no crowds! The kids had a blast jumping off the huge rocks, finding secret pools, and climbing as high as they could. I could not think of a better way to spend Thanksgiving. 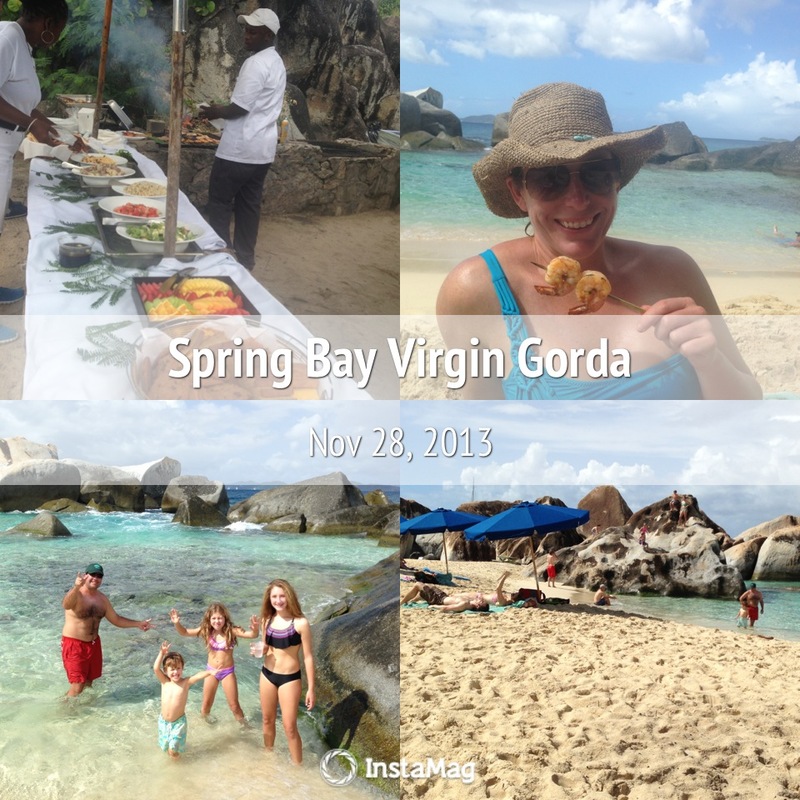 It was awesome, and by far the best deal for excursions at Little Dix Bay. It was only $35 for the adults, half price for the kids, and free for children 5 and under. This is a ‘don’t miss,’ if you are staying at Little Dix Bay. We also took the “Dogs” snorkeling trip with lunch on Norman’s Island, and I would also highly recommend this excursion. 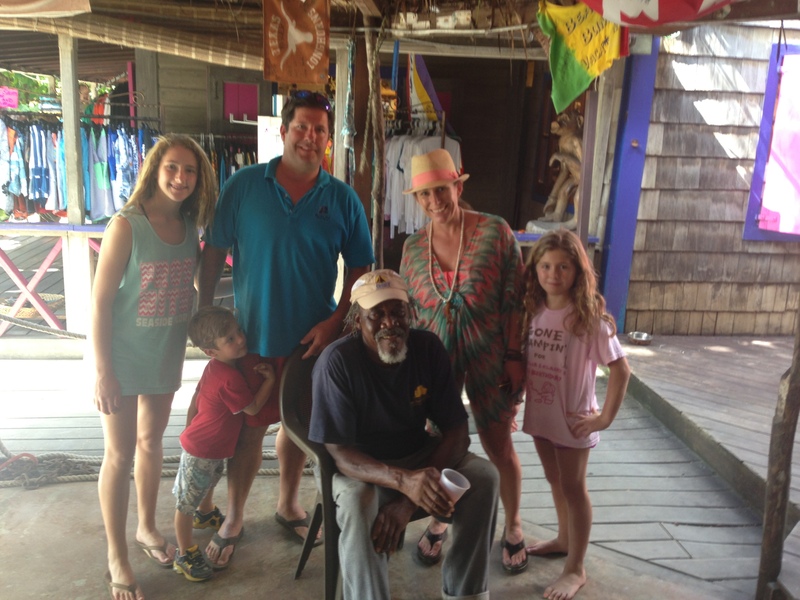 Additionally, we did two scuba dive trips with Dive BVI. Both of the scuba diving trips were great, and we would do them again. 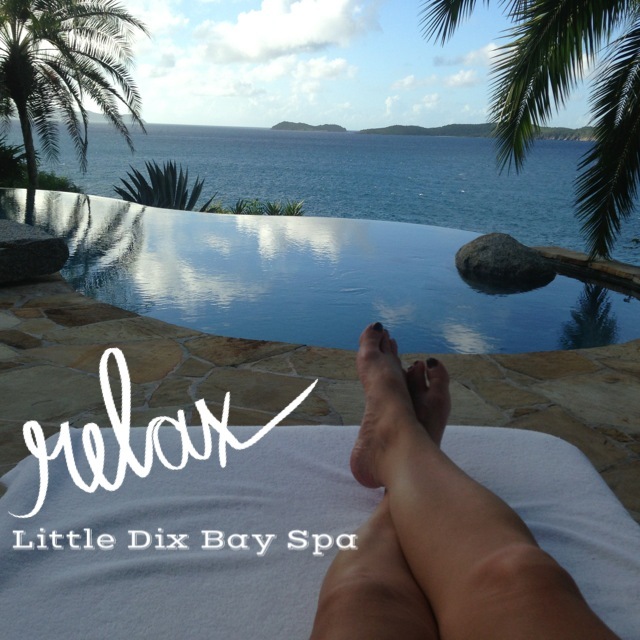 No stay at Little Dix Bay is complete without a visit to the spa. 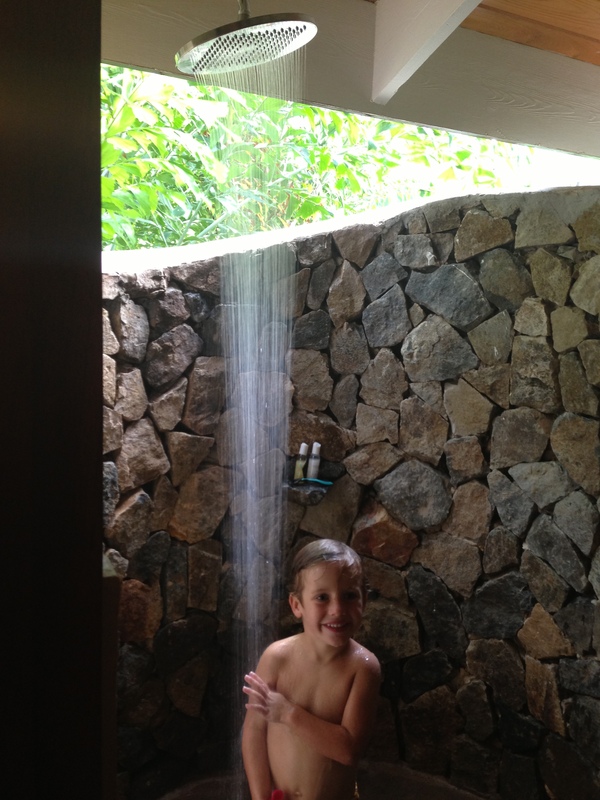 I have been to a lot of fantastic spas like the Esperanza in Cabo, but this one took the cake. How about the Little Dix Bay food? I am going to sum this one up pretty quick by telling you that it is the best resort food we have had in the Caribbean, even the buffets. I am not a “buffet” kinda chick, and I did not have high expectations. Don’t let the buffets scare you away. Think Lobster Ceviche…enough said. While we loved the decadent buffets, we did not like the fact that it was the only “real” option at breakfast time. Sometimes you just want a bagel, right? After the 4th day, a $150 breakfast bill got old. Especially, when we were not eating very much. There is a complimentary continental option for early risers, but the options were very limited and the kids did not like what was offered. You can also order room service, but after you ordered a few things for each person it did not come out any cheaper than the buffet. There were 3 items offered at the breakfast buffet that could be ordered a la cart, which is not enough. I think they should expand on the a la cart items for the breakfast. On a positive note, children get the breakfast buffet for half price. 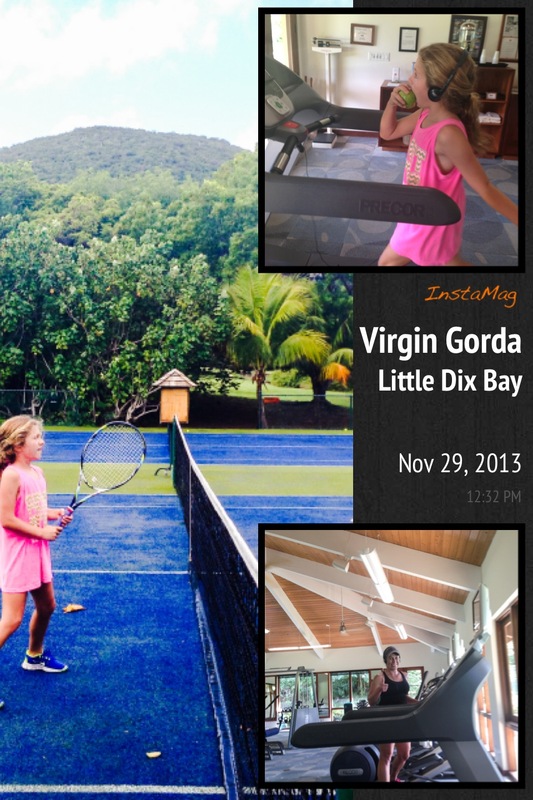 We also loved the tennis facilities, and the gym at Little Dix Bay. There were tennis clinics offered daily, and the girls enjoyed those. 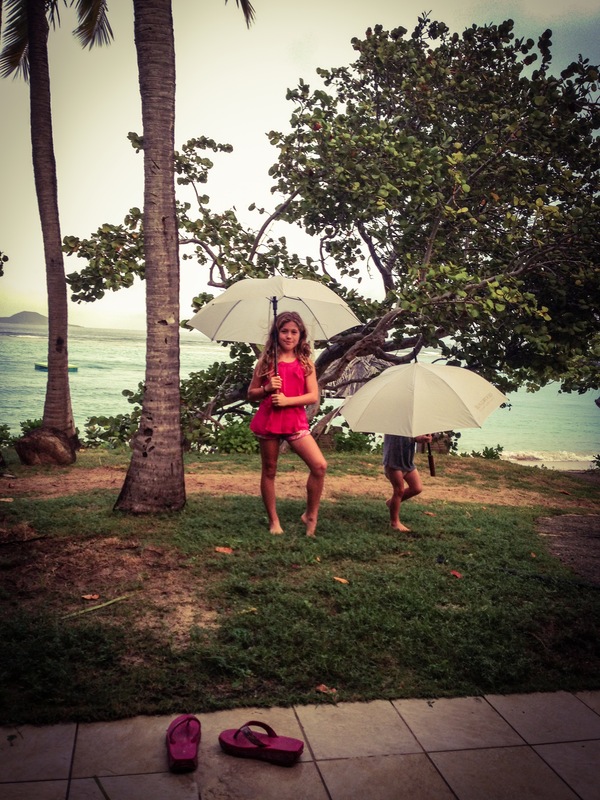 It does rain quite a bit in Virgin Gorda, but Little Dix has these precious umbrellas on hand and the rain never lasts very long. Hello. just wondering why you had a bad experience at the Ritz. I have an upcoming stay at Ritz St Thomas and then onto Little Dix Bay. Can shorten my stay at the Ritz and lengthen at Little Dix. Please explain your comment. You stated you would write more about it in another post but I could not find it. We arrived late at the Ritz in St. Thomas & there was no one there to help direct us to the front desk. Once we found the front desk, we waited for a lengthy amount of time to check in. 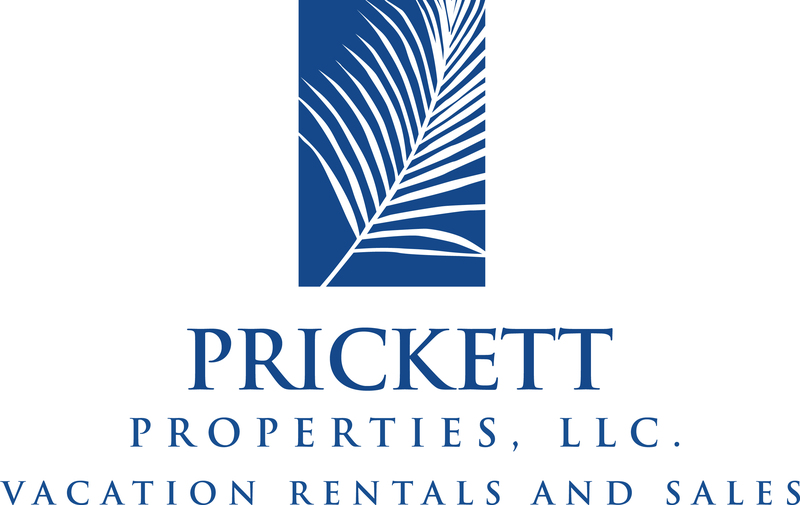 We booked with the American Express Fine Hotels & Resorts Program that provides a room upgrade upon availability, which the hotel did not have. The main problem was that the hotel put us in a room on the 3rd floor and the hotel has no elevators! Our youngest child was still in a stroller. They offered to help us carry our sleeping baby in the stroller that evening, but offered no solution for the rest of our stay. On our way to our 3rd floor room, we jokingly asked what happened to the “welcome drinks” and the concierge said something along the lines of “I know right ? 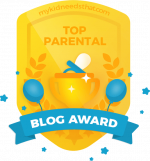 !” Later that evening we arrived at the outdoor restaurant to hopefully have dinner before retiring for the night. We were turned away because we did not have a reservation. The restaurant was literally empty. They sent us to another restaurant that was indoor which we did not want to do with 3 small kids. It was just a debacle. I honestly think that some of this was due to a change over in management at the time of our stay. Hopefully things have gotten better! Please share the boat charter you used to get from STT to Little Dix Bay. 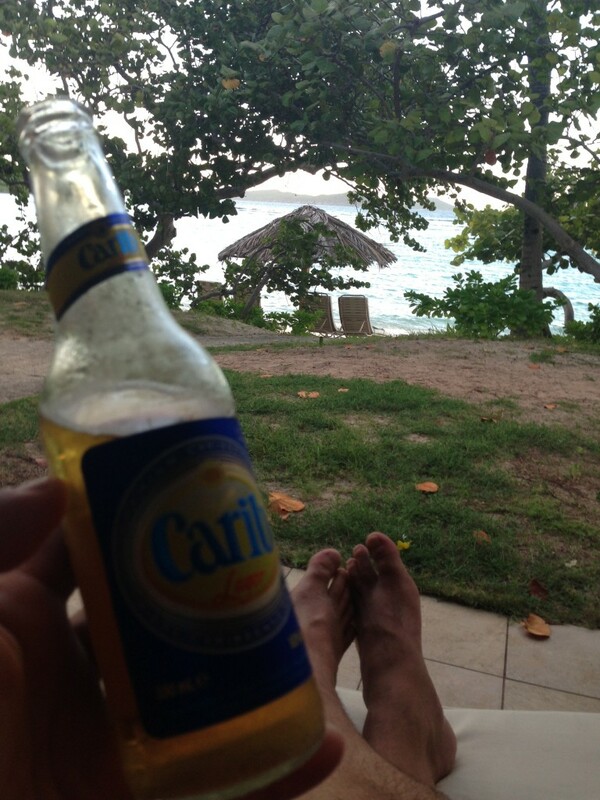 My wife and I will be staying at LDB, via St Thomas in July. Your Blog is extremely helpful. We used NautiNymph out of Red Hook. The captain and the boat were about $700, so this might be a little pricey for just the two of you. We had 5 people on the boat so I was able to justify it a little easier! There are ferries that run from STT to Virgin Gorda regularly that will be far less expensive option. It really depends on your flight schedule and the ferry schedule. Ours did not match up, so we had to book a private boat charter. We made a day of it and stopped by Foxy’s to check-into customs!